Happy Friday! 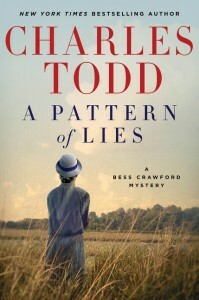 Today I'm a stop on the TLC book tour for Charles Todd's latest Bess Crawford mystery, A Pattern of Lies. After accompanying a convoy to Canterbury, Bess finds herself temporarily stranded in the area thanks to train issues. Fortunately for Bess, she runs into a former charge who lives nearby and invites her to stay while waiting for the train. Bess's leave isn't all rosy though as Mark Ashton and his family have recently found themselves the target of a rather violent smear campaign. The Ashton family had long been in charge of a local powder factory, one the government took over at the height of the war. Just two years ago, though, an explosion led to a series of fires that all but leveled the factory, killing many of its employees. For a while it was thought to be either a tragic accident or even sabotage on the part of the Germans, but just a few months ago eyes turned to the elder Ashton. Now, the townspeople are convinced Mark's father is responsible. After he's arrested and the family home is attacked, Bess decides she must do something to help. Her plan to track down the one and only witness to the explosion, though, puts her in the crosshairs of a killer who is determined to keep said witness - and Bess - away at all cost. So Bess witnesses some pretty horrid behavior on the part of the Ashton's neighbors, and yet it's easy to see just how something like that would happen. One of the characters even tells Bess that people need someone to blame. Someone to place all of their anger and remorse upon. And that anger and remorse are at extreme levels considering how long the war has been going on when this takes place. In truth, Bess's world is nearing the end of the war but it's not over just yet. As has been my experience with past titles in both the Bess Crawford series and the Ian Rutledge series, the authors have done a great job capturing the sentiment and spirit of the time. This - and Bess - makes this quite an appealing series to me personally. While I know it's fiction, it offers me a glimpse into an era that's fascinating for a number of reasons. And one of the most obvious of those reasons is that it was an era neither I nor my parents existed in! But I haven't talked about the mystery itself! Honestly, I've come to expect tight plotting and a considerable amount of suspense in any Charles Todd read and A Pattern of Lies was certainly no exception. For more on the authors and their work you can visit their website here. You can also like them on Facebook. I agree that this writing team really does capture the "sentiment and spirit of the time" - they do such a great job with that!